The Graduation Show of the Philippine Women’s College of Davao Senior High School Arts and Design Visual Arts Group formally opened its door for viewing last February 15, 2019 at the Morning Light Gallery and Art Shop. The 18-piece art works are the results of the senior high schools specialized subjects of Art Research, Developing the Filipino Identity in the Arts and Art Exhibition based on their chosen fairy tale. Complimenting these fairy tale paintings are local ornate patterns and designs that guard the edges of each canvases – just like the decorative nature of medieval inspired illuminated manuscripts. The show’s center piece is the giant collaborative drawings by each of the artist forming their exhibition title – Our Very Own Fairy Tale that is also used for their posters and postcard invitations. 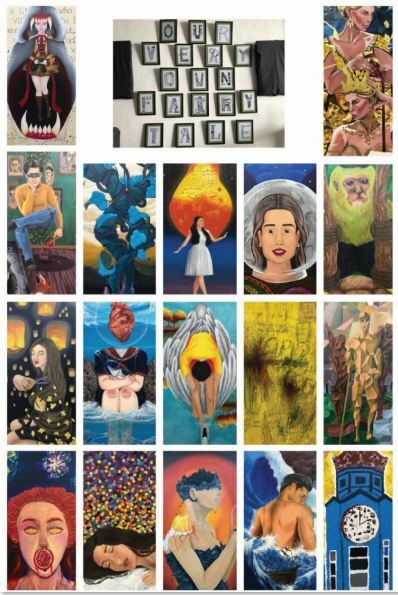 The exhibiting student artists are: Aya Alesna, Patric Barrete, Mia Basoc, Michael Batingal, Iree Brillantes, Diane Calag, Ezrae Elarcosa, Jen Enarsico, Bon Gilles, Kim Lagura, Kristine Maberez, Hanna Pacaldo, Suprimo Paitan, ZJ Perez, Queene Sordilla, Jenilyne Tadle, Kiana Tanduyan and Raffael Westram. All the paintings are rendered in symbolical imagery that has personal history borrowed from their chosen fairytale. Like the sold-out work of Iree Brillantes’ Glassy Shore that took the fragility of the Little Mermaid into a heartful soul with broken dreams still holding on to her child like innocence. Or the head on abstractions of Bon Gilles’ Cupid and Psyche whose yellow flashing colors contrasts the questioning texture, dark texts and scribbles. Or the empowering imagery of a “Rapunzel” ending her own predicament by cutting her own hair that ties her down that is romantically painted by Hanna Pacaldo. Not to be missed are the rich text of the artist’s statement that equally matches each work; Kiana Tanduyan’s statement is like a prose poetry that perfectly complements her painting and Patric Barrete’s is a literal adventure explained as he explored, experimented and get enamored with cubism as he painted Hercules. Can you guess which fairy tale, myth or legend that these paintings are inspired from? The works that can be viewed from the exhibition with their center piece are individual drawings of the letters of the exhibition, Our Very Own Fairy Tale. The last and 19th letter is drawn by Rob Tañedo – their art teacher.